Discussion in 'Classic Menswear' started by srivats, Feb 7, 2010. I am starting this thread as a point of comparison/discussion for those of us in love with OCBDs. Much has been written about collar roll in different threads - I remember one of Vox's stellar posts - now only if I can remember where he posted that! Doc has also posted some excellent photos of his own ... I am going to find and add them here. Great idea Sri...I want some BD collars on my next few shirts, but am lost when it comes down to describing them...a photo would be perfect. I'm a big fan of PG's collar rolls. Out all my favorite overall is Brooks Brothers (the original of course), however I found that the now discontinued Lands' End Hyde Park OCBD has the best roll. Polo Ralph Lauren has the best feeling collar (feels like there's no interlining at all), but the collar points are too small to get a good roll; the same problem with CM, J. Crew and Gap. I find the Mercer and BB collar rolls most pleasing to my eyes. BBBF, if it fits you, is excellent as well. Mercer shirts have no fusing/interling and that is part of the reason why they roll so well - the size on them is 3 7/16" which is slightly longer than BB. From what I understand, all their collars are hand attached as well. Lands End comes next ... the hyde park is very good value for the money. I also have 2 older shirts from RL (no logo!) and they are terrific as well (no lining). I like them both ways, but the lack of tie space you have is killing the shirt. The Borrelli collars are really nicely shaped, but IMO are a bit too stiff. Over the years, I've bought more than a dozen OCBDs from Brooks Brothers and gave Mercer a crack. I would've tried J. Press, but their stock shirts are tents on me and they don't do made-to-measure OCBDs. Until now, no OCBD has completely satisfied me. 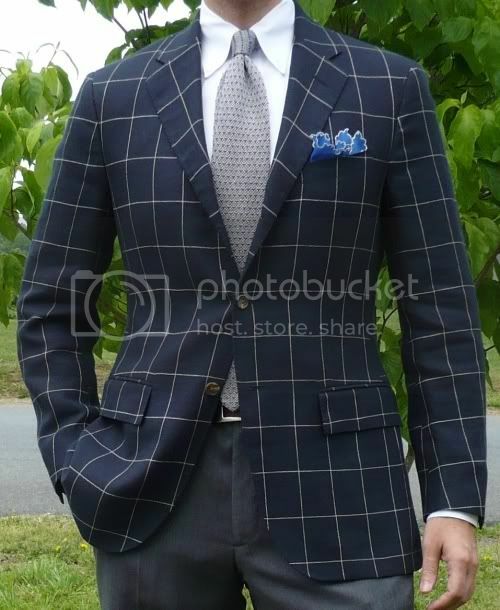 So, I decided to give Brooks Brothers' made-to-measure program another try--but this time, I implemented some modifications to the classic format. 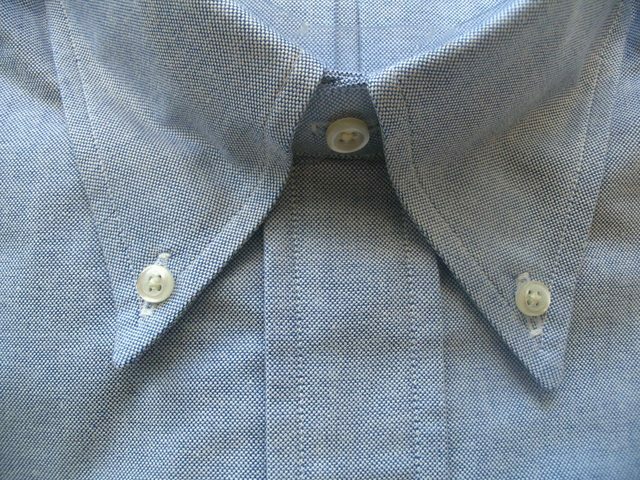 To make the collar higher and improve the collar roll, I had them implement a two-button collar. The old, single-button collar tended to flatten on my neck; this one stays up and looks better with a jacket. In the interest of making the shirt dressier, I also replaced the standard placket with a French placket (or 'no placket', if you prefer). The BBBF strikes me as a caricature of the traditional roll. It's almost Eye-talian, and so I cast a suspicious eye upon it. But it's nice for wearing without a tie. I have some vintage J. Press shirts that have a very nice roll despite the construction. A shame they feel compelled to keep tinkering with it. I like the flap pockets. I did a week o' the white buttondown a while back, but I don't know if I still have the pics. 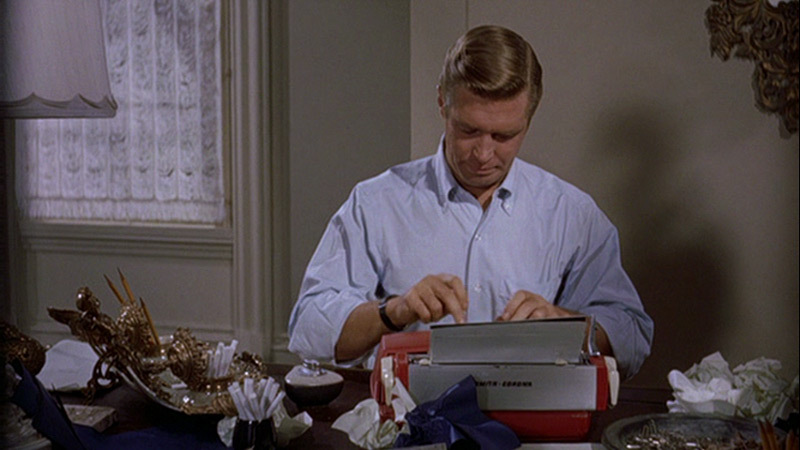 Sero, old-school Brooks, Sulka, Press, etc. I'll dig around and see if I can find them. I found that BBBF collars are hit or miss,some of them make a really good roll to wear with ties but most of them look hideous so I wear them without a tie. I think same can be said about any button down shirt,it is hit or miss. I really like this one,I wish all my OCBDs made such a roll,albeit only some of them turn out like that. Are these made in China ones? I wish my Hyde Park had a roll anywhere close to that. I like the tailored fit Hyde Parks and find the fabric good quality and love the price. I have found Mercers have the best roll of shirts I have tried (Press, Hyde Park, Gitman, BB OTR, BB MTM), except for an older BB. BBC, that looks terrific - thanks for the photos! I'd love to try BBBF, but being pretty tall and slim makes it impossible for me; I have to buy slim fit/extra slim fit BB in 15.5/36. I'd like to try a Mercer, but aren't they known for their full cut? I see you can order a shirt 2" slimmer, but I wonder if could request something smaller along the lines of BB slim fit? Yes, they are made in china. The outside breast pocket dates from '65 or '68...that and the "All Cotton" notation on the label, indeed, dates it to the late 60s. There would have to be care instructions on the label from '71 onward. I won't ask where you got it or whom you killed. Fortunately, it does fit albeit just a hair tight, but I like'm that way. I plan on wearing it infrequently and just in casual, open collar situations. 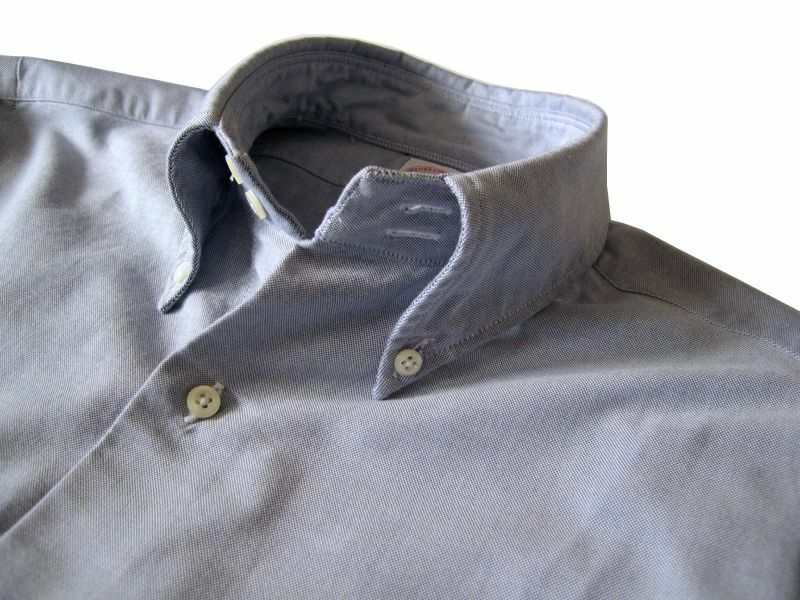 The six-button front, instead of seven, also seems to help the overall look of the collar. Picked it up from another forum member after searching for one for quite some time.